SD Memory Card Formatter△ - single purpose app for Windows and Mac. On the Configuration page, click the Expert link. Or, for macOS, Linux, and Windows 10, you can use the URL: http://pi-star.local/admin/expert. For older versions of Windows: http://pi-star/admin/expert. Click the SSH Access link and log in. To use the full screen version of the SSH Access client, click the "fullscreen SSH client" link at the bottom of the window and log in. SSH client for Android, iOS, Mac, Linux, Windows: Termius△. Note: You can find the IP address that your Pi-Star hotspot is using in the Wireless Configuration section of Pi-Star. Updates are run overnight automatically, but you can run this command as the root user to force an update at anytime. Must be logged into Pi-Star. Running Pi-Star Update from the dashboard updates the dashboard binaries, and hostfiles. Running an update from an SSH client (sudo pistar-update) also updates the OS. Upgrades the base system services and packages. Upgrades are available less often than updates. How to SSH into Pi-Star hotspot△ (video), by David Cappello, KG5EIU. Port forwarding is becoming less necessary for hotspots, but may be needed for QuadNet Smart Group and some X-Reflectors (XRF). For QuadNet Smart Groups – In order to use Smart Groups with a home hotspot, you need to set up port forwarding of port 40000. For this purpose, it's necessary to forward public and private UDP. For XRF – If your router doesn't support uPNP and you don't want to enable "Use DPlus for XRF" in Pi-Star's D-STAR Configuration section, you can set up port forwarding for XRF. Per Andy Taylor in the Pi-Star Users Support Group: "If your router supports uPNP, Pi-Star will request the ports required to be forwarded, however many people disable uPNP and so you may have to do some manual port forwarding. REF/DCS reflectors can be connected without any port forwards, but XRF reflectors require port UDP/30001 to be forwarded to your Pi-Star's IP address." Apple routers don't support uPNP. For info about setting up port forwarding, see: AirPort – Port Mapping Basics using AirPort Utility v6.x△. Pi-Star Wiki article: Ports to forward if not using a uPNP network△. Log into Pi-Star via SSH. There's a good answer about sudo su and related commands on AskUbuntu.com△. Note: For Pi-Star version 4 and above, this happens automatically as part of the first boot up. Pi-Star runs in read-only mode and takes up very little space on the microSD card. If Pi-Star is used for a hotspot, 4 GB usually is more than enough space. However, if Pi-Star is used for a repeater or you run it hard, 8 GB is probably better, and you should expand the filesystem to take up all the available space. Optionally, look at the post-expansion numbers. Example: When I ran pistar-expand on the filesystem on my 16 GB microSD card to test it out, I ended up with 1.28 GB used (9%) and 13.37 GB free. Pi-Star updates the lists of reflectors and repeaters stored in the hosts files (/usr/local/etc) nightly, but there may be times when you want to use one that isn't listed or override an incorrect entry. In this case, you can add it manually to the override hosts file in the /root directory, which is the root user's home directory. Once you've done this, you can run a regular Pi-Star Update without losing your changes. Note: The filename, including capitalization, must be exact. Available hosts files: DCS_Hosts.txt, DMR_Hosts.txt, DPlus_Hosts.txt, NXDNHosts.txt, XLXHosts.txt (for DMR), DExtra_Hosts.txt, and P25Hosts.txt. Make your additions or changes. Note: For the DPlus_Hosts.txt file, you can add a capital L to the end of the line to force the entry in this file to override any duplicates in the main Pi-Star host file. Write out the changes (^o), and exit (^x). Note: From what I've seen, the P25 and NXDN Hosts files work a bit different from the other modes. The other modes append the addition in the root hosts files to the hosts files with the same name in /usr/local/etc. But for P25 and NXDN, they are added to a different file in /usr/local/etc: P25HostsLocal.txt and NXDNHostsLocal.txt. Regardless, the outcome is the same. After you run the Pi-Star Update, you should find your added reflector in the P25 or NXDN Startup Host drop-down list on the Configuration page, and it won't get deleted by the automatic overnight update. Here's an example of the file for adding a DPlus entry. As of Pi-Star Dashboard 20190115, this is now handled via Configuration > DMR Configuration > DMR Master = DMRGateway > XLX Startup Module. 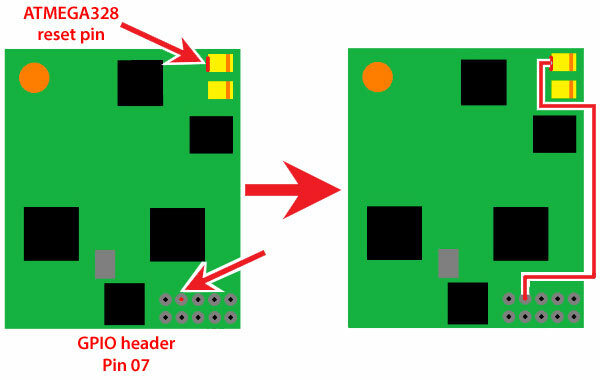 It's possible to update the firmware of several hotspot boards via Pi-Star. Note: These instructions are for hotspots. For updating firmware on MMDVM repeaters, see the Pi-Star Wiki article: Headless MMDVM Firmware Building△. Note 1: For the ZUMspot/MMDVM_HS firmware, you can find release notes on the Github page: juribeparada/MMDVM_HS△. Note 2: Beginning with Pi-Star dashboard v20181214, you can see in the Radio Info section which TCXO chip (12.288 or 14.7456 MHz) a ZUMspot/MMDVM_HS board is running. This info is needed to determine which firmware update to apply, for example, with the MMDVM_HS_HAT or MMDVM_HS_DUAL_HAT, there are separate firmware update script commands for the different chips. Note: It isn't necessary to first put Pi-Star into read-write mode (rpi-rw); the script takes care of that. A prompt will tell you to press any key to begin. When the update is finished, another prompt will tell you to press any key to reboot Pi-Star. Be patient, this step takes a bit of time during which it doesn't look like anything is happening. Once the firmware update is complete, you can see the new version in the Radio Info module on the Pi-Star Dashboard or Admin pages. The script for updating a ZUM Radio MMDVM-Pi board can be found here: GitHub: juribeparada/MMDVM_man△. Sometimes after performing a Pi-Star or firmware update, for some reason the dashboard won't re-open in the browser on my Windows 10 laptop when using the standard http://pi-star/ or http://pi-star.local/ URLs. When that happens, find the hotspot's IP address and use that. After the dashboard opens the first time using the IP address, the URLs should work again. To find the IP address, I use an Android LAN scanner app. Alternatives: the Mac app called Airport Utility, in which the IP address is listed under the name Pi-Star, or the Windows app called Advanced IP Scanner△ (full scans can take a long time, but if you limit the IP range to what your local network uses, it is quick enough). For those rare situations when a firmware update breaks things, Michael Eckhoff, K5MRE, posted instructions for downgrading ZUMspot/MMDVM_HS firmware in the Pi-Star Users Support Group. Followup note: I found out there is a script for downgrading the MMDVM_HS_Hat boards, but haven't tried it. Use at your risk! Here's the manual script by K5MRE. I've tried this and it worked, but there are no guarantees. Use at your own risk! again, where modem_fw.bin is the bin file that matches your board. where modem_fw.bin is the bin file that matches your board. Alert: This method doesn't work with Pi-Star 4.0.0-RC3. At this time, the only way I know of to perform this type of firmware upgrade is to use a Pi-Star 3.4.x image. I just move the DVMEGA onto another RPi running 3.4.x, perform the firmware upgrade, and then move the DVMEGA back onto its RPi running 4.0.0-RC3. After that, everything works fine. Tom, ON4TOP, has come to your rescue. 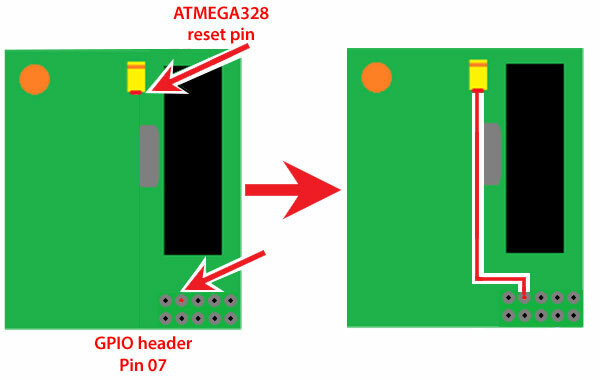 He has figured out that it is possible to flash the DVMega firmware using the Rpi itself with the DVMega still in situ by wiring the reset pin of the ATMEGA328 directly to a spare GPIO port and then using (a slightly modified version of) avrdude to flash the hex file straight over /dev/ttyAMA0. The same procedure works just as well on a single band DVMega…. Subsequently, Andy Taylor, MW0MWZ, adapted this method for use with Pi-Star. What follows is a summary of Andy's adaption. For updating the DVMEGA firmware using a Raspberry Pi 3, solder a jumper wire between the ATMEGA328 reset pin and GPIO header Pin 7. Important! This jumper configuration is for use only when using the Raspberry Pi for updating the firmware. When using the BlueStack board, there is a different configuration and method (see Updating DVMEGA firmware using a BlueStack board△). To find the latest firmware version, visit the DVMEGA Downloads△ page and look in the section for BlueDV-MMDVMhost for Raspberry Pi. Thanks to Bruce, NB0DV, for his post about the change that happened with v3.26 on the Pi-Star User Forum△. Note: I added --tries=3 after I ran into a problem with the DVMEGA site being unavailable the first time I tried this. The retries kept happening and each one took a long time, so this step seemed to be in an unending loop. I ended up rebooting the device to break the looping. Turns out the default for wget△ (web get) is 20 retries, which seems excessively high to me for this operation. Note: The -d switch causes the files to be extracted into the dvmega folder. The -j switch extracts files into the current folder without the folder structure in zip file being recreated. (or you can exit the SSH session and reboot from the Pi-Star dashboard). Set up Pi-Star with the MMDVMHost Configuration Mode you want to use. Be sure to apply changes. Scroll down to the Modem section and find the RXOffset setting. Set up the second to view the dashboard so you can view the resulting BER readings. The easiest thing to do is to make calls lasting a few seconds to a Parrot talkgroup or reflector. In the Expert Editor, adjust the RXOffset setting, make a parrot call, and observe the readings. You're aiming for a BER of less than 1% preferably less the 0.5%. Begin with +/-100 offsets, and see how that affects the BER. Once you find the lowest BER with the +/-100-step offsets, repeat the process with +/-50-step offsets, and finally +/-10-step offsets until you find the lowest BER. Repeat this process in each MMDVMHost Configuration Mode in which you're experiencing high BER, until you achieve the optimal BER in each one. Alternative and more exact method to calculate offsets: Daniel, K9NPX, has a good article on using MMDVMCAL to get more exact RXOffset (and TXOffset) settings for a DMR radio: Hotspot Offset Calibration△. Note: JP is the default country code because it has the broadest selection of channels. It's fine to leave that as is, no matter where you are located. Insert into your computer a microSD card that was preloaded with the Pi-Star image (such as the one that comes with a ZUMspot kit) or flash a fresh Pi-Star image to a microSD card. Note: You can ignore any system messages about needing to format the card that are displayed when you first insert the card or after you finish flashing the image. After flashing the Pi-Star image to the microSD card, eject it, and then reinsert it. Copy the wpa_supplicant.conf file to the boot partition of the freshly imaged microSD card, and then eject it again. and becomes the installed wireless network settings. If necessary, you can subsequently change the wireless network settings (add, edit, or delete) via Wireless Configuration△ in Pi-Star's Configuration view, or via WiFi Config in Pi-Star's Expert Editor. You also can connect a Pi-Star hotspot to a cell phone, wirelessly or via USB tethering. This makes it possible to easily create a mobile hotspot. Important! Make sure your battery pack or power supply provides enough amperage to your hotspot; otherwise, it may not work or may work erratically. This is always the case with hotspots, but since connecting a hotspot to a cell phone is often done to make the hotspot mobile, and a battery pack is often used in that case, it's worth emphasizing this. Note: I had to turn off the VPN service that was running on my Android phone before I was able to connect to the Pi-Star dashboard via the phone's hotspot connection, whether the connection was via WiFi or USB tethering. If you haven't already, set up your phone's hotspot with a name and password. Important! Don't use special characters in your phone's WiFi Hotspot network name (SSID). They can prevent connection. Add your phone's hotspot name and password to Pi-Star. Turn on your phone's portable hotspot. Turn on your Pi-Star hotspot and give it time to connect wirelessly to your phone's hotspot. In your phone's browser, open the Pi-Star dashboard. On some phones you may be able to use http://pi-star/ or http://pi-star.local/ to connect, but on many phones, like my Android device, you must use the Pi-Star hotspot's IP address. Note 1: I run a VPN on my Android device and have found that I need to disconnect from the VPN in order to connect my Pi-Star hotspot to my Android device's portable hotspot. Note 2: Some Android devices show a list of connected devices on the Android device's hotspot settings page, and you can tap a listed device to discover its IP address (thanks to Mike, K2GC, for this hint). My Android device doesn't have this feature, so I use an Android LAN scanner app, and then use that IP address in my Android browser to connect to the Pi-Star dashboard. If your RPi is connected to a monitor and keyboard, you can also run ifconfig. In the returned results, look for the IP address for USB 0. Again, on my Android device, I have to start by turning off the VPN. Then I turn on the Pi-Star hotspot, wait 3 minutes until it goes into Pi-Star Auto AP mode, and then select it in my Android device's list of available WiFi networks. Android freaks out a bit about being connected to a network that doesn't have internet connectivity, but I tell it to calm down and carry on. Next, I use the standard Pi-Star Auto AP mobile IP address (192.168.50.1) as the URL in my browser to connect to the Pi-Star dashboard. Once the Pi-Star dashboard opens, I navigate to the Configuration page and add the wireless network credentials in the Wireless Configuration section. Scan for networks does work. After adding each wireless network, I click Save (and connect), but of course, it won't connect, because the Pi-Star hotspot is locked into the private Pi-Star Auto AP network. After I add all the networks I want to, I navigate to the Power and page and reboot. Once the Pi-Star hotspot has reconnected to my Android device's portable hotspot via regular wireless connection, I use the Android LAN scanner app to find its IP address (which will be different from the Pi-Star Auto AP mobile IP address) and use it as the URL in my browser to connect to the Pi-Star dashboard and begin using it. Note 4: If your RPi is connected to a monitor and keyboard, you can also run ifconfig. In the returned results, look for the IP address for USB 0. Note: John, K1WIZ, posted in the Pi-Star Users Support Group introducing the idea of using USB tethering with a hotspot running Pi-Star: "This allows your hotspot to use the USB connection (instead of WiFi) so that your battery stays charged and isn't drained. Also, using USB is far superior to using WiFi to tether to a phone with a data plan—WiFi is half duplex, whereas the 'Ethernet over USB' is full duplex." Plug your Pi-Star hotspot into your phone via USB, and then turn on the Pi-Star hotspot. Different models of phones will behave differently. On my Android phone, I get a notification that the phone is being powered via USB. Once I see that, message, the USB tethering option is enabled in Settings 〉 Network & Internet 〉 Hotspot & tethering, and I can turn it on. In your phone's browser, open the Pi-Star dashboard. On some phones you may be able to use http://pi-star/ or http://pi-star.local/ to connect, but on many phones, like my Android phone, you must use the connected hotspot's IP address, which you can find using a LAN scanner app. Note: Thanks to Carty, KA2Y, for sharing his experiences setting up USB tethering with me, which helped me improve these notes. There may be times when you want to change the way a date is displayed, for example, if you're using a Nextion screen. This can't be done via Pi-Star Configuration; instead, you must configure the system Locales setting. Note: I tested this a lot of times in various ways. If I used Pi-Star's built-in SSH Access client, it all worked fine. If I used an external SSH client, after rebooting, when I returned to the Pi-Star dashboard in my browser, MMDVMHost would stop running, and I needed to power off the hotspot and then restart it to get things working properly, including the new locale. A list of locales is displayed. Use the arrow keys to navigate to the locale(s) you want generated for the system. Press the Space Bar to select or deselect a locale. Note: For both of my installation of Pi-Star, two locales were enabled by default were en_GB.UTF-8 and en_US.UTF-8. Once you have selected the locale(s) you want generated for the system, press Tab to select Ok (or Tab again to select Cancel), and then press Enter. A list of your selected locales is displayed. Use the arrow keys to highlight the locale you want to use as the default system locale, press Tab to select Ok (or Tab again to select Cancel), and then press Enter. You'll be returned to the SSH command line. Wait for the system locales to be generated. Setting up and using DRMGateway is significantly more complex than simply setting up a single DMR Master for one of the systems: BrandMeister, DMRPlus (a.k.a., DMR+), and XLX. Per Andy Taylor in the Pi-Star Users Support Group: "DMR Talkgroups - those are controlled by the master (rather than the client). On DMR+, you need to use the options line; on BrandMeister, you need to sign up for self-care and set them using their nifty app [ed note: the app is named: My hotspots]." For related info, see the following note: Pi-Star's BrandMeister Manager module. StartRef=4000 = sets the startup reflector to unlink. RelinkTime (optional) = # of mins of idle time before relinking to StartRef. TS1_1=9 = sets time slot 1 talkgroup 1 to talkgroup 9, which in the DMR+ world sets Direct Mode Operation (DMO) mode as un-linkable. On the DMR network, DMR reflectors△ enable DMR repeaters to be dynamically connected, similar to how reflectors work on D-STAR. When DMRGateway is enabled, XLX reflector traffic uses talkgroup 6, DMR+ reflector traffic uses talkgroup 8, and BrandMeister uses talkgroup 9. Dec 2018 – BrandMeister USA no longer supports the use of reflectors via its network. XLX reflectors use prefix 6 = 64001 - 64999. Link using a private call, then talk via a group call to TG 6. To change XLX modules, 64001 = module A, 64002 = B, etc. As of Aug 2017: Private calls to 8001 - 8999 can be used to select XLX masters, for example, 68313 = XLX313, 68950 = XLX950. As of Jan 2018: Private calls to 8000 - 8999 can be used with DMRGateway to link to XLX reflectors, for example, 68313 links to XLX313's default module (and drops any previously linked reflector), 68950 = XLX950 (on its default E module/4005). As of Jan 2018: A private call to 64000 will drop the link to an XLX module, but not to the XLX master. Per Andy Taylor in the Pi-Star Users Support Group: "If you need to override the XLX default room/module numbers, make a file, /root/XLXHosts.txt, with only the XLX masters that you need to override in there, using the same format as the file downloaded from the update server. Set the room to whatever you want. This will stay put through the update process." For more about this, see the note: Method for overriding default XLX rooms. DMR+ reflectors (use prefix 8) = 84001 - 84999. Link using a private call, then talk via a group call to TG 8. There's a paper that provides a very good explanation of the interplay between XLX and XRF reflectors: "XLX and XRF Reflectors, DMR, and use with DMRGateway" by John Fields, K6KD, of the D-STAR Round Table Forum. To download the paper, subscribe to Groups.io: Kings of Digital Notify△. You can then find the paper in the Files section: XLX XRF DMRGateway:Pi-Star 060818.pdf△. Craig, W1MSG, has a good video about all of this: DMRGateway△. We are an open ircDDB routing network that doesn't require registration. We contend that valid Amateur Radio license is enough to operate on the QuadNet2 USA IRC Network. We do not require a special club or repeater call sign for use on the network. As long as the call sign is valid and being legally used, we fully support your use of dongles, hotspots and repeaters (both homebrew and ICOM) on the QuadNet network. The purpose of QuadNet is to support ROUTING. Routing is an alternate method of connecting to other D-Star users. Routing is a powerful method to connect to individuals, repeaters or groups on a D-STAR network. Routing is a connectionless protocol that does not require a Hosts.txt file to to connect. The QuadNet network server does all the heavy lifting for you. You just have to program your radio with the routes you want to use. If there is an individual, repeater or STARnet Group on the QuadNet network, you should be able to route there just by knowing the call sign, or in the case of Group Routing, a "subscribe call." Group Routing means routing to a STARnet Digital Group. A STARnet Group is kind of like a reflector, but it is actually more like a repeater without the RF transceiver. A STARnet Group can have many individual users "subscribed" to it. Anyone subscribed to a STARnet Group will hear all traffic on the Group. Another very popular cross mode reflector would be the Quadnet Array. This is one of the most active systems outside of REF001C and REF030C. On DMR you can use Brandmeister TG 31012. Alternatively you can access the transcoder directly by using XLX307 as your DMR master and then use talkgroup 6. What do these services do, anyway? PiStar-Remote – In the old days, before MMDVMHost was born, ircDDBGateway (D-Star) had the ability to listen for commands via RF; you could command your system to reboot, shutdown, etc., from your radio. Then came MMDVMHost – this feature was missing, and so a need became apparent. PiStar-Remote is my answer to that need. It's far from perfect, but gives you some basic remote control ability via RF, including RF kill switch. PiStar-Keeper – This service has a VERY specific use… In the UK there is a special class of repeater license that requires the keeper to be present. This service uses bluetooth to watch for the keeper's cell phone, and disables the services when the keeper moves too far away. Like I said, REALLY specific! Note: Configuration settings for PiStar-Keeper are in the /etc/pistar-keeper file. You can access these settings via the Expert Editor's PiStar-Remote tab. Once you have set this feature up the way you want, you can call these codes from your radio to invoke the associated command. For example, to reboot your hospot: if you're using a DMR radio, you can make a private call to talkgroup 8999997; if you're using D-STAR, you can make a call to URCALL=REBOOTPI. Enabled MUST be set to true. Callsign MUST be set to your CALLSIGN, which MUST be UPPERCASE. For the mode(s) you want to use, if you want to enable the shutdown, hostfiles, getip, or 8Ball commands, you MUST remove the leading # (comment symbol). APR 2019 – In previous versions of Pi-Star, the default commands for DMR were in the 899999x range; however, in the current version of Pi-Star, 4.0.0-RC3, the default commands for DMR are in the 999999x range. This might conflict with BrandMeister's AirSecurity feature, which uses that range. One consequence of this is that if you use a PiStar-Remote command in the 999999x for BrandMeister, you'll hear a strange announcement, "Secret not found," although the command still will work. Until this gets sorted out, it might be best to revert to the 899999x range, so that's what I'm showing below. Note 1: As of the 20190127 dashboard update, the GETIP command is working. Be patient, it takes awhile for the text message to be sent to your radio with the IP address. Note 2: The hostfiles command triggers a request for a host file update. Note 3: When rebooting or shutting down, the behavior is quite different compared to using the software Reboot and Shutdown buttons in the Pi-Star Power view. After keying up the remote RF command, the call is logged in the Gateway Activity and Local Activity sections, but then the Pi-Star dashboard just freezes; it doesn't look like anything more is happening. If you then try to navigate to a different view like Configuration or Dashboard, you'll get a "Site can't be reached" error message, which tells you the command has been executed. If you choose to use BrandMeister, you can register for an account on the BrandMeister Network△, which gives you access to a variety of "SelfCare" information and settings, including access to settings specific to your hotspot via the "My hotspots" menu. If you use that feature, you can turn on Pi-Star's BrandMeister Manager module in order to access some of the key hotspot settings from Pi-Star's Admin view, including: drop calls and dynamic talkgroups, link/unlink reflectors, and add/remove static talkgroups. To enable the BrandMeister Manager module, see the instructions on the Pi-Star Wiki: PI-Star integration with BrandMeister API△. Note 1: BrandMeister views hotspots as having only one time slot: TS0. So for hotspots, the BrandMeister Manager time slot options are ignored, and when you make changes, you'll see the status update message refer to "TS0." Note 2: As of Pi-Star dashboard version 201901014, the BrandMeister Manager tools support duplex hotspots; the Slot selection now applies to Drop QSO and Drop All Dynamic. Note 3: If Pi-Star is configured for a repeater, the time slot options are used. NXDNGateway was added in Pi-Star v3.4.12. 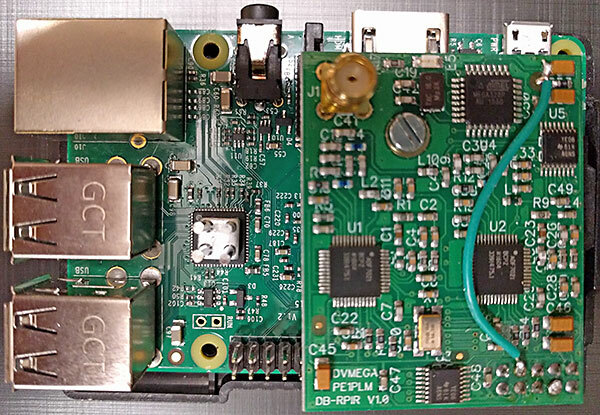 Watch the Pi-Star NXDN Upgrades video by Craig, W1MSG. Refer to the Pi-Star Wiki article: Adding custom firewall rules to Pi-Star. Note: This info, which won't be overwritten by an update, will be appended to the main NXDNHosts.txt file that is stored in the /usr/local/etc folder whenever an update is run. The Expert Editor CSS Tool let's you play around with the color scheme. Note: In this example, I changed Background Banners to the web color royalblue (hex value 4169E1) and the Tables HeadDrop to dark gray (hex value 303030). Note: "If you took it all too far and now it makes you feel sick," the CCS Tool's Factory Reset button resets the CSS options back to their original settings. Per Andy Taylor in the Pi-Star User Forum△: "RSSI values depend on the radio—the stock values are there for MMDVM_HS units that support RSSI; if you use anything else, you may well need to tune it." # to send to the DMR network. # the software will use those to work out the in-between values. 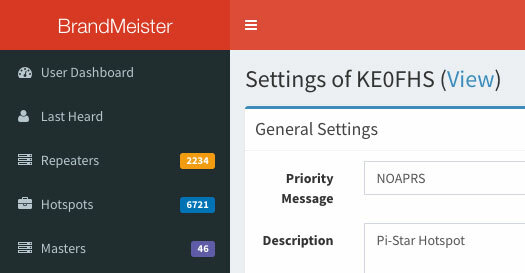 Thanks to KH6HZ for this hint posted in the Pi-Star User Forum△: A sysop of a repeater or a hotspot can prevent APRS reporting by adding the tag NOGATE or NOAPRS to the Priority Message field in the BrandMeister dashboard. For a hotspot, you can find that field in the My hotspots settings. Note: There's also an APRS-related setting in the Expert Editor > ircDDBgateway Quick Editor: aprsEnabled (0 = disabled; 1 = enabled). It's also a good idea to make a new backup of your Pi-Star V4 configuration. There is a script for linking to and unlinking from reflectors from the command line, for example, in an SSH session.